A couple of weeks ago, I was enjoying life a little bit more. As they say, life is always better at the beach! We took a family trip down to Florida. 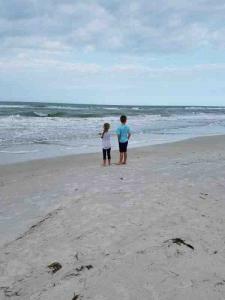 Here are some things I thought I’d share about our Madeira Beach vacation. We rented a condo that worked out great for us. What really helped is that we’ve stayed in this condo complex before. Back in 2010 we took a trip, also with my in-laws and stayed in a different unit. On top of that, this area was where my wife and her family vacationed when she was a girl. So, knowing so much about the area in general was a big help too. Familiarity definitely helped improve our Madeira Beach vacation. Originally we were planning to drive, but ended up flying. However, since all public schools in Michigan are off at the same time, the airlines all jacked up their prices flying out of Detroit. We found some great fares out of Columbus, Ohio, which was about a four hour drive. Saving money was great, but the added stress of driving kept me on edge. After all, it would only take one accident along the way to take away our cushion. Luckily, we were fine, but I was nervous. ended up taking Uber rides wherever we needed to go. All told, our Uber rides added up to about $125 plus tips, which was a significant saving over renting a car to drive while there. We had warm, sunny weather for most of the trip, which was great. However, a good portion of our trip was very windy. This made being near the water very difficult with blowing sand. But, having a pool right there definitely kept us exactly where we needed to be. Having both options was great. We had a really great condo that we found. It was two bedrooms. Each bedroom had a TV. Having a TV in the kids room was great because they could have some down time after coming back tired from being at the water. It was also fully furnished and had lots of supplies needed for the pool and water. The condo had just about everything we needed, but we ended up forgetting a few things on our shopping trip. Paper plates, napkins, and salt and pepper were all things we would have liked but didn’t think of. There was nothing we didn’t have but lots of things we would have loved to have had. We made a list! We ate at a lot of different restaurants, but also made quite a few meals in. This mix kept our costs down a bit, and made a good mix of ‘on the go’ versus enjoying the moments. We ate all of our breakfasts in, and then would generally have lunch or dinner out. It still wasn’t exactly cheap but it kept things in check. If you can’t tell we loved our vacation. All of us came back tan. We all came back tired. Our son came back with a sore ear from all the swimming. All told, those are all signs that we had lots and lots of fun. And we did. So much so that we already put a deposit on the same unit for next year! And did I mention that repeat visitors get a 10% discount? Woo-hoo! Readers, do you have any great family spring break stories? Please let me know what you did in the comments below. Thanks so much for reading!